Visit Adelaide River War Cemetery and Survivors’ Lookout for their historical value. Relax by the water at Mindil Beach and Lameroo Beach. 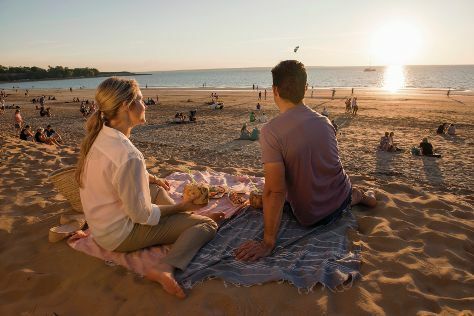 Explore Darwin's surroundings by going to Litchfield National Park (Buley Rockhole, Florence Falls, & more), Batchelor (Litchfield National Park, Batchelor Museum, & more) and Territory Wildlife Park (in Berry Springs). Spend the 26th (Fri) wandering through the wild on a nature and wildlife tour. Spend the 1st (Wed) on the water with a fishing tour. And it doesn't end there: examine the collection at Defence of Darwin Experience, take an in-depth tour of Darwin Aviation Museum, take in the architecture and atmosphere at St Mary Star of the Sea Catholic Cathedral, and look for all kinds of wild species at Crocosaurus Cove. For photos, more things to do, where to stay, and more tourist information, read our Darwin planning tool . April in Darwin sees daily highs of 38°C and lows of 28°C at night. Wrap up your sightseeing on the 24th (Fri) early enough to travel back home.